Its been a strange spring for weather. I can remember complaining about it back in April when it was in the 30’s for temps. Now its almost June and the lows are still in the 30’s for temps. Just as there is fast, faster and ludicrous speed, the weather went from crappy, to bad and now is ludicrous bad. My Trek rep stopped in this week and said in his 13 years this is the second worst spring for bike shops (said 2000 was bad too) and that made my think good and bad. Bad that it is so crappy, but good in the fact that I planned well enough to weather it out no problem. Once again, I hear that its gonna be better starting next week. If I had a dime for every time someone told me that. Also, I stopped complaining about the weather cuz its been kinda bad everywhere. And not just a few degrees colder, I mean, at least I still have roof on my house. Compared to the south we have nothing to complain about here (anymore). Saturday has the road group doing an extended ride. About 90 miles total leaving at 7am. Also, this 12 hour MTB race is only 20 minutes away. At press time I am torn. Most likely will ditch the group ride. Too far. Too early in the year. Too early in the day. And will not race the MTB. Just not feeling it. Maybe a road ride out to the MTB race. Get the best of both worlds. Either way I plan on riding a bike. Plus now we all have an extra day to get in some extra miles this weekend. People ask me why am I still racing my MTB in Citizen class. Ive been racing now for about 10 years on and off. Some years faster. Some years slower. While I have never dominated a Citizen class race I for sure could move up. But I dont want to. For me racing isn’t about placing. My reason to race has nothing to do with results. For me its just another way, a different way, to ride my bike. I choose to race in the Citizen class because all(most) of the riders there are doing the same as me. Just out for a cool bike ride with others. The fact that we are all going as fast as we can (or not) is immaterial. Move up a class and the mentality changes. Just a move up to Sport class and I can feel the “mood ‘” of the race change. Too many aspirations of someday getting to a World Cup. Too much aggression. Too many riders caring a bit too much on what place they will take. Ive seen this for 10 years now. Ive seen rider after rider move up a class, get beat up a little and just quit cuz they no longer can medal. That leads me to question their love of riding a bike. That leaves me to believe they are not there cuz they love riding bikes, they only ride to win. And when they cant win, they will ditch it for some other sport that they can win, whatever that is. Im not saying that you should not try hard and do your best. Im not saying you should not train. Im not saying its bad to go fast. I have a lot of friends who are fast AND love to ride a bike. Im just sayin’ you should be there cuz you love to ride and keep everything in a good perspective. If your fast, thats cool. If your not, like me, thats cool too. I love the atmosphere of the local cross scene here in Wisco. If fact I love it so much that the store will focus its ” racing ” budget entirely on cross racing. Its just so laid back. And thats not entirely by design. It just has not grown big enough yet. Its just big enough to get some attention, but still small enough to keep a simple attitude. So that is why Im putting together a traveling cross bike demo unit and putting on a race here this fall. I want to get in on the ground floor and hope that when the series grows (and it will), the attitude wont change and that everyone will still race like their racing in the Citizen category. During the Halloween race every year you see riders throw away their results just to ride with some elaborate costume. Not ever caring if their being scored. That…. is something you will never see in a MTB race. And that….. is why I like cross. And my love for cross bikes doesn’t hurt the cause either…. I think everyone remembers their first new bike. Last nite I brought home a bike for my grand daughter. Her first. The smile says it all. She had to have it in her bedroom with her all nite. We’ve all been there! Tonite I get to do it all over again with my grand son. Their only 3 months apart. I get to see this a lot in the store. Parents come in and get their kids a bike off the floor. The kids are pumped. It makes me a little pumped too remembering the way I feel when I got a new bike. Good times. 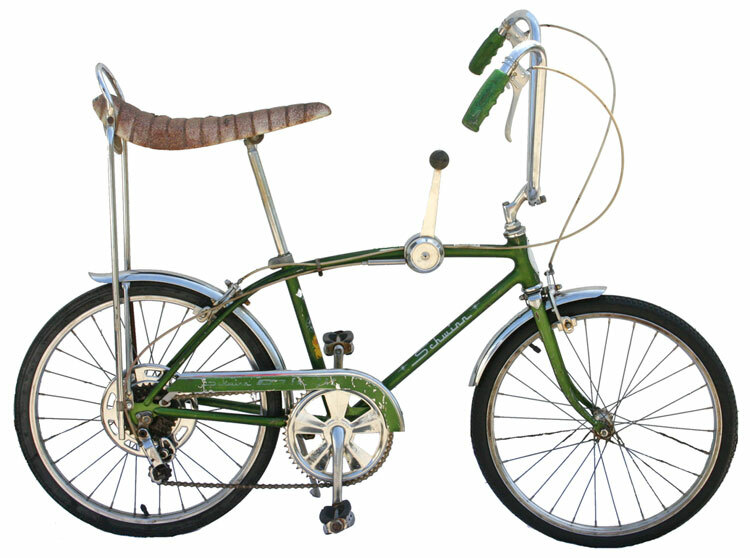 My first bike was a Schwinn fastback. Complete with a 5 speed shifter on the top tube, banana seat and sissy bar. I rode it around in the house and crashed into the TV(some things never change) putting a big scratch in it (TV, not bike). My dad was not impressed. I experienced that feeling for quite some time. I remember in 2008 I got my first Madone. It was a 5.2. Just like my grand daughter I had to have in my bedroom with me. True. That total pumped feeling. Cant wait to ride it! While I still do get that feeling, sort of, its a little bit subdued by the fact that I own a bike store now. I can basically ride what I want. The feeling is not the same cuz the bikes are not really mine. I just use them. Its hard to explain to you guys. Im sure you have no sympathy to anyone who rides a 9k retail Madone. I know I wouldn’t. But maybe you can give me a little? Pretty much the highlite of my weekend. While things didn’t go as planned it was good to get out this weekend. Never made it to the bike race Sunday. It just did not work out for me. Rain all afternoon and nite on Saturday. We did manage about an hour and a half of riding Saturday morn. But no longer did we get to the car it started pouring. So we drove around and stopped at every coffee and ice cream shop we could find. But I was pretty bored. To the point of going to a movie in Eagle River Saturday nite. I almost never go to movies as my A.D.D. never lets me sit for more than an hour. But I survived. Sunday morn we just did not get up in time to race so we stopped at more coffee and ice cream shops and drove home. So it was a strange weekend. But was still better than not. It seems that we got our token 2 days of sunny and warm weather for the month as its now back to rain in the 40’s today. Did get in almost two hours yesterday. On the Madone. Im likin’ that bike more everyday. Am thinking of getting a 90mm dish wheel for the rear. Keep the front at 65mm. Also I have dug out the track bike. Am getting thoughts of circles in my head. I mean more than usual.